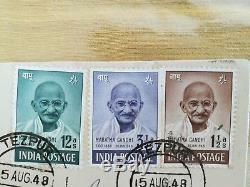 Indian Independence 1st anniversary stamps showing Mahatma Gandhi. 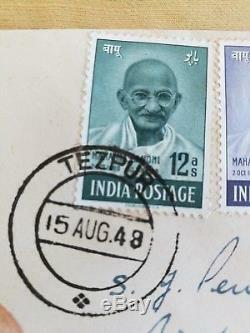 First day cover 15 August 1948. 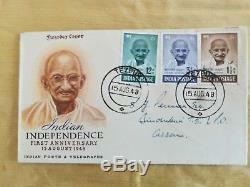 The item "Indian Independence Gandhi SG305-307 15 August 1948 First Day Cover" is in sale since Saturday, July 14, 2018. 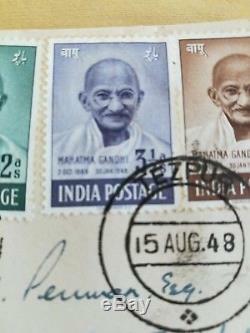 This item is in the category "Stamps\Asia\India (1947-Now)". 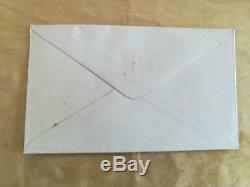 The seller is "gravescottguy" and is located in Bexley. 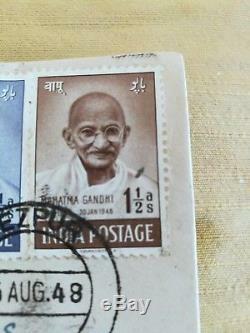 This item can be shipped to United Kingdom, Austria, Belgium, Bulgaria, Croatia, Cyprus, Czech republic, Denmark, Estonia, Finland, France, Germany, Greece, Hungary, Ireland, Italy, Latvia, Lithuania, Luxembourg, Malta, Netherlands, Poland, Portugal, Romania, Slovakia, Slovenia, Spain, Sweden, Australia, United States, Canada, New Zealand, Israel, Norway.